Why Did Jesus Leave Heaven and Come To the Earth? (Ver 1.2) There are probably several possible answers to this question and I am only going to address one of them today in this Bible study. I have already established the fact that Jesus was God present in the flesh in other Bible lessons. Therefore, I will not repeat that information again today. 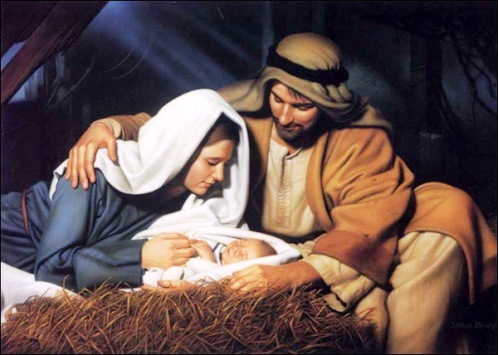 Just know that God the supreme creator, became a human male and was born into the world in a Bethlehem manger approximately 2000 years ago. Jesus walked the planet in the form of human flesh for approximately 33 years and was then willingly crucified on a cross by the Roman Empire and the captive nation of Israel. That was just a quick synopsis of some of the Bible Christian theological basics that you should already be intimately familiar with. But, why was it necessary for God/Jesus to come to earth in the flesh and to shed His blood? What transpired or made it necessary for only God Himself to appear on the planet to solve the problem? Couldn’t God just create something new, or say something or do something or send someone else? Isn’t God still God? Why was it so important for the supreme God to do this personally? I think that is an amazing question to consider and one that if you really understood the answer, would explain so many other questions that you have yet to figure ask. Today I will introduce you to just one of the most important answers to this question and I hope that you can at least begin to grasp these basic concepts. What we see from the Bible is that God had a problem. Of course we know that God is all powerful, all knowing, ever present and capable of doing practically anything. I did say “practically anything” and that will probably rock some people’s religious boats (minds). You see extremely religious people like to believe that God is capable of doing anything and everything and there is nothing that is impossible for Him. That would be a great truth if that was what the Bible really said, but since the Bible doesn’t say that I can’t agree with any of that kind of thinking. You see in one part of the Bible God says that it is impossible for Him to lie (Heb 6:18). If you understand what the definition of “impossible” means it clearly states this will never happen under any circumstances. I’ve heard some very religious theological ignorant people who have tried to explain this away using human reasoning that whatever God says, if it was not previously true when He said it that it would become true after He said it. After all He is an omnipotent God and truth is always relevant to what God wills. In other words if God says the sky is Green in color when it is not, then yesterday the sky might have been blue but tomorrow it would suddenly appear to us as green. So God would change things to fit what He said today and if tomorrow He wants it a different way He would change to cause it to be different. However, that reasoning just does not conform and balance with other scriptures either. The Bible clearly says that God is God and that He does not change (Mal 3:6). In other words He is a constant and consistently good God who does not change His mind or do one thing today and another totally different opposite thing tomorrow. I guess I got off of the main subject so let’s get back to why Jesus came to earth in the flesh. We can determine from the context of this verse that one of the primary themes being communicated to us is concerning SIN! We can see that God is telling us about the source of sin, how and where sin originated. This verse calls the source the devil, but this is just another name for the ancient serpent also called Satan. If you read Revelation 12:9 you will see the true identity defined of this evil one, with several of his other names and symbolic descriptive titles being also connected together. What we begin to learn from this verse is the origin of God’s problem and the root cause for every evil that has entered into our world. I know that some are still struggling to see how God could have a problem. I’ve heard many religious minded theological people say that God is simply using Satan as a pawn and Satan doesn’t do anything unless he first checks with God and asks permission and God grants it or rejects it. In other words God is in ultimate control of everything and everyone and nothing happens unless God has a specific plan and purpose for it. That deceptive reasoning is ignorance gone to seed and borderline stupidity. That line of thinking doesn’t fit what God says in the Bible and doesn’t match in a balanced way with the description of a God who is called LOVE (1 Jn 4:8). Many humans have a very perverted concept of what true LOVE is because they based their concepts of love on their experiences here in this world. They then misapply these wrong concepts to explain why God does or does not stop bad things from happening in our world. When the earthquake hit Haiti I heard one minister on TV say something like this was God’s judgment for their sinful lifestyle. In other words God specifically caused this event to happen to punish some very wicked people. That is just idiotic when people think like that. We haven’t really talked about why Jesus came to earth, but it was for many reasons and one of them was to pay the price for all of our sins, past, present and future. His blood was a ransom payment for the sin of the world. So if God is now killing people because of their sin, then why did He come in the first place? We are all sinners, why didn’t He just kill us all and start over? Here we have another paradox being presented. God says everything has been placed under the feet of Jesus and then reveals not everything is yet there. Do you understand that statement? Well, probably not! First again why is it necessary for everything to be placed under Jesus if everything was already under God in heaven? This verse goes along with what Jesus said to us Matthew 28:18 that ALL power has been given to Him but yet we still read in many other verses that Satan remains present on the earth and that Satan still has power (Luke 10:19). This presents some very difficult scriptural and theological conflicts to resolve. What we see from this short lesson is the fact that God had a problem. God’s problem originated with Satan or Lucifer as he was also called. Satan did something that caused the human race to be in a terrible self-solvable dilemma. Satan had corrupted God’s creation and became the “god of this world” (2 Cor 4:4). Being called the god of this world implies that he had taken control over everything that God had previously given to Adam in Genesis 1:26. However, God had a planned solution in place already from the beginning to get it all back in a legal way that not only solves our problem, but also solved God’s problems simultaneously. Our problem was sin and death and God’s problem was primarily Satan. God used Jesus to fix both of these problems. Jesus redeemed us from the consequences of sin. Through His shed blood our sacrificial lamb was slain and the payment for sin was made once for all. But through the death of Jesus on the cross, God’s covenant with Satan was also terminated and now Satan can be thrown into hell legally. I know I said a lot and I quoted a lot of scriptures and didn’t give you references to a bunch of them, I’m sorry about that. I also know this is a lot of new things to think about and study in the Bible and I hope that you do the research to see if these things that I said are true or not. I challenge you to study for yourself and not to take my word for anything. Posted on February 13, 2010, in Jesus and tagged Bible, Christianity, Church, God, Interpretation, Jesus, Religion, Satan, Truth, understanding. Bookmark the permalink. 7 Comments. Isn’t what you said just a another version of the “ransom” theory of atonement. If not how is it different ? First off I do not ever teach theories or the doctrines of men, I only teach God and the Bible and what I find in it. I have never heard about the ransom theory so I cannot comment on the similarities or differences to what I just said. If you want to enlighten me on this theory I will listen to what you have to say. Hey good info, I did not think I would find exactly what I was searching for until I came across this site on google! Thanks for taking the time to read my blog. I hope you found something worth while. Exactly what were you looking for? Very interesting interpretations. I enjoyed your unique point of view.